Around the beginning of the 3rd millennium cal bc a cremation cemetery was established at Forteviot, central Scotland. This place went on to become one of the largest monument complexes identified in Mainland Scotland, with the construction of a palisaded enclosure, timber structures, and a series of henge monuments and other enclosures. The cemetery was established between 3080 and 2900 cal bc, probably in the 30th century cal bc, which is contemporary with the cremation cemetery at Stonehenge. Nine discrete deposits of cremated bone, representing the remains of at least 18 people, were identified. In most instances they were placed within cut features and, in one case, a series of cremation deposits was associated with a broken standing stone. This paper includes the first detailed assessment of the cremated remains at Forteviot and the features associated with the cemetery, and explores how the establishment of this cemetery may have been both a catalyst and inspiration for the elaborate monument building and prolonged acts of remembrance that occurred at this location over a period of almost 1000 years. The paper also outlines the parallels for Forteviot across Britain and, for the first time, draws together the dating evidence (including Bayesian modelling) for this major category of evidence for considering the nature of late 4th/early 3rd millennium cal bc society. The results and discussion have wide implications and resonances for contemplating the establishment and evolution of monument complexes in prehistoric Britain and beyond. This paper reports on the second season of the new fieldwork at Euesperides (Benghazi). Excavations continued in Areas P (a large building with early Hellenistic mosaics) and Q (an area of streets and buildings built against the line of the Archaic period city wall), and were commenced at a site in the Lower City (Area R), where evidence for purple dye production from the Murex trunculus shellfish was found. In addition, a programme of machine-cut evaluation trenching was carried out in an area to the south of the Sidi Abeid mound to determine the limits of the archaeological area; this showed that occupation deposits continued for some distance to the south-east of the zone formerly considered to have encompassed the city. Geophysical prospection was completed in the Lower City, giving a fuller understanding of the city plan and of manufacturing activities. Preliminary quantification of the fine pottery suggests heavy reliance on imported wares (some 90%) to meet demand for tablewares, and carries important implications for the volume of ancient shipping and trade reaching Euesperides. This paper reports on the first season of a new project at Euesperides (Benghazi) aimed at studying the urban development and economy of the city. Two area excavations were started, the first on the site of early Hellenistic pebble and tessellated mosaics discovered in 1998, and the second in what appears to be an area of houses and workshops built against the city wall on the east side of the mound of Sidi Abeid. Geophysical survey and surface prospection was also undertaken; it appears that the lower-lying extension to the city was much larger than previously thought, and several modifications are necessary to previously published plans of the site. Much of the lower city is covered with large spreads of deliberately crushed shells of Murex trunculus, indicating the production of purple dye on a significant scale. Other evidence of urban production was also recovered, notably metal-working, while study of the ceramic assemblage shows widespread trading connections, with significant imports of coarsewares besides the expected fineware and amphora imports. Despite its importance in the lived experience of dementia, symptom fluctuation has been little studied outside Lewy body dementia. We aimed to characterize symptom fluctuation in patients with Alzheimer's disease (AD) and mixed dementia. A qualitative analysis of health records that included notations on good days and bad days yielded 52 community-dwelling patients (women, n = 30; aged 39–91 years; mild dementia, n = 26, chiefly AD, n = 36). Good days/bad days were most often described as changes in the same core set of symptoms (e.g. less/more verbal repetition). In other cases, only good or only bad days were described (e.g. no bad days, better sense of humor on good days). Good days were typically associated with improved global cognition, function, interest, and initiation. Bad days were associated with frequent verbal repetition, poor memory, increased agitation and other disruptive behaviors. Clinically important variability in symptoms appears common in AD and mixed dementia. Even so, what makes a day “good” is not simply more (or less) of what makes a day “bad”. Further investigation of the factors that facilitate or encourage good days and mitigate bad days may help improve quality of life for patients and caregivers. This article is an ecumenical conversation between Pentecostal and Anabaptist-Pietist traditions. Emerging out of this will be a suggestion that the Christian worship practice of footwashing may provide a means to share Christian love and fellowship that is inclusive of all Christian traditions. In this article we will addresses important points of theological intersection of these two storied traditions, specifically soteriology as a ‘Christian synergism’ and ecclesiology as an ‘alternative society’. These traditions approach ecclesiology through soteriology with a conscientious concern to form eschatological communities. We believe that these traditions must engage in ecumenical dialogue for mutual theological support in forming and sustaining ‘alternative Christian communities’ while continuing to participate in ecumenical dialogue with other traditions. Background: This paper describes an innovative education program for the management of mental health problems in long-term care (LTC) homes and the evaluation of its longer-term sustainability. Since 1998, the [ldquor]Putting the P.I.E.C.E.S. Together[rdquor] learning initiative has been providing education sessions and related learning strategies aimed at developing the knowledge and skills of health professionals who care for older persons with complex physical and mental health needs and associated behaviors, in Ontario, Canada. A major focus of this province-wide initiative was the development of in-house Psychogeriatric Resource Persons (PRPs). Methods: Evaluation of this initiative included the completion of pre- and post-education questionnaires (over three data collection time periods) assessing learner confidence (N = 1,024 and 792, for pre- and post-education, respectively) and session evaluation questionnaires gathering feedback on the session (N = 2,029 across all sessions). A survey of LTC homes in Ontario (N = 439, 79% of the homes in the province) was conducted to assess longer-term sustainability. Results: Ratings of the sessions indicated that they were relevant to learners' clinical practice. There were significant increases in ratings of ability to recognize and understand challenging behaviors and mental health problems, and in ability to use a variety of assessment tools. Few homes (15%) do not have a PRP; over 50% of the staff who completed the first session in 1999 continue to serve as a PRP and to apply learned skills. Conclusions: A learning initiative with supportive and reinforcing strategies can develop in-house PRPs to enhance the care of the elderly in LTC. Incorporation of PRP functions into job descriptions and management support contributed to the success of this initiative. This study highlights the importance of work environments that support and reinforce the use of learned skills to the success of continuing education and quality improvement initiatives in LTC. Liszt's piano works have always rightly been regarded as his greatest musical monument. Even those who find his general style inimical have acknowledged that his technical imagination as a writer of piano music and his command of keyboard colour were unsurpassed. Brahms, otherwise an inveterate hater of Liszt's music, found in his operatic fantasies the ‘classicism of keyboard technique’, but the mastery of his original music, often denigrated by his contemporaries, is now routinely acknowledged. To be sure, Liszt could be justly charged with his own criticism of Schubert: ‘he was too immoderately productive, wrote incessantly, mingling what was trivial with what was important, what was great with what was mediocre, paying no heed to criticism and allowing his wings free flight’. The composer who in 1856 completed his remarkable Dante Symphony, but the same year served up the pompously banal Festvorspiel, was perhaps more than usually subject to the vagaries of inspiration, but a century after his death Liszt's core masterpieces remained firmly fixed in the standard concert repertoire, and many other lesser-known works would reward more regular exposure today. It was interesting to note the varied degrees of tension that he brought to the different composers. When Chopin was being played, only the most delicate precision would satisfy him. The rubatos had to be done with exquisite restraint, and only when Chopin had marked them, never ad libitum. Nothing was quite good enough to interpret such perfection. A student played one of Liszt’s own Rhapsodies; it had been practised conscientiously, but did not satisfy the master. There were splashy arpeggios and rockets of rapidly ascending chromatic diminished sevenths. ‘Why don’t you play it this way?’, asked Liszt, sitting at the second piano and playing the passage with more careless bravura. ‘It was not written so in my copy’, objected the youth. ‘Oh, you need not take that so literally’ , answered the composer. This dialogue between Liszt and a pupil with surprisingly modern attitudes from an 1877 masterclass in Rome presents in a nutshell one fundamental problem in the interpretation of his piano music, namely, how essential, or even advisable, is strict adherence to the letter of the score. An associated problem concerns the spirit of the score: how did Liszt expect his music to sound, and what interpretative approach should we adopt if we wish to respect this? We could well argue – and this would ironically be a typical nineteenth-century view – that Liszt performance in the twenty-first century ought to be moulded by modern concert conditions, instruments and expectations, and not those of a bygone era. But even if this attitude is adopted, it is surely better adopted on the basis of knowledge of what we are rejecting, rather than as a merely plausible substitute for ignorance. 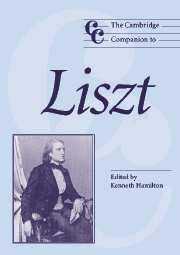 The following pages address issues in Liszt performance by briefly discussing Liszt's aesthetic outlook, the pianos he used, his playing style and the legacy of his teaching. There exists a large body of material – some written, some recorded – that not only amplifies, but sometimes contradicts, instructions in Liszt's scores. In fact, even to talk about ‘the score’ in the case of many Liszt pieces is problematical, as many exist in a multiplicity of versions with differences ranging from minor nuances to major reworkings. This Companion provides an up-to-date view of the music of Franz Liszt, its contemporary context and performance practice, written by some of the leading specialists in the field of nineteenth-century music studies. Although a core of Liszt's piano music has always maintained a firm hold on the repertoire, his output was so vast, influential and multi-faceted that scholarship too has taken some time to assimilate his achievement. This book offers students and music lovers some of the latest views in an accessible form. Katharine Ellis, Alexander Rehding and James Deaville present the biographical and intellectual aspects of Liszt's legacy, Kenneth Hamilton, James Baker and Anna Celenza give a detailed account of Liszt's piano music - including approaches to performance - Monika Hennemann discusses Liszt's Lieder, and Reeves Shulstad and Dolores Pesce survey his orchestral and choral music. That night Sylvia took me to a friend’s house, where some Belgian musicians played chamber music … They played Mozart’s G minor piano quartet with Mark Hambourg at the keyboard. Hambourg was a pianist of the old virtuoso school; his percussive tone and his freelance treatment of the work was wholly unadaptable for Mozart. Mark Hambourg's (1879–1960) cavalier approach to Mozart, as recalled by Artur Rubinstein (1887–1982), typifies one popular image of the Romantic virtuoso pianist: stylistically insensitive, contemptuous of textual fidelity and, to cap it all, too loud – especially in chamber music. Rubinstein heard Hambourg in 1915, but equally harsh criticisms of the ‘virtuoso school’ had been penned at least as far back as the nineteenth-century heydays of Liszt and Thalberg, whose concert triumphs served as models for many later pianists. Even today, some critics seem unable to utter the word ‘virtuosity’ without the appendages ‘empty’ or ‘meretricious’. This contrast between playing that somehow metaphysically exposes the soul of music without drawing attention to technical accomplishment, and playing in which tasteless display is paramount echoes Mozart's two-hundred-year-old criticism of Clementi as ‘a mere mechanicus’. Of course, in a fundamental sense this contrast is misleading. No player, however elevated his interpretative ability, can communicate his intentions without a sound instrumental technique (unless he becomes a conductor), and most of the great Romantic pianists were both interpreters and virtuosos of the highest order. The golden era of Romantic pianism lasted roughly one hundred years, the famous musical duel between Liszt and Thalberg in 1837, and the death of Paderewski (the most highly paid concert pianist of all time) in 1941 being convenient, if slightly arbitrary, markers at either end. Perhaps the greatest source of wonder in Liszt's life was that he composed anything at all, let alone anything of lasting greatness. The man who, from an early age, had crisscrossed Europe as the greatest travelling virtuoso, providing, with the onset of puberty, much material for gossip columns, might have been forgiven for taking the Wildean view, ‘My art is my life’, and leaving it at that. Even after he settled down in Weimar in 1848, to devote himself to composition, his existence was scarcely less hectic, and the B minor Sonata, ‘finished 2nd February 1853’ according to Liszt's manuscript note, was merely one of a maelstrom of activities. Although he had made at least two preliminary sketches of themes for the Sonata – one of the opening two motifs in 1851, another of the beginning of the Andante sostenuto in 1849 – it is likely that the main compositional work was started in the latter part of 1852. Exactly how Liszt could have found the time to compose is difficult to imagine. In June 1852 he had conducted two concerts at the Ballenstedt-am-Harz music festival, the programmes including Beethoven's Ninth Symphony and Berlioz's Harold in Italy. In September he conducted Verdi's Ernani. A Berlioz week in Weimar was scheduled for November, when the Romeo and Juliet Symphony, the Damnation of Faust and Benvenuto Cellini were performed. Looming on the horizon after this was a Wagner festival for February 1853, by which time The Flying Dutchman, Tannhäuser and Lohengrin had to be fully rehearsed. If this immersion in some of the most difficult avant-garde music were not enough, Liszt's private life was also running less than smoothly.